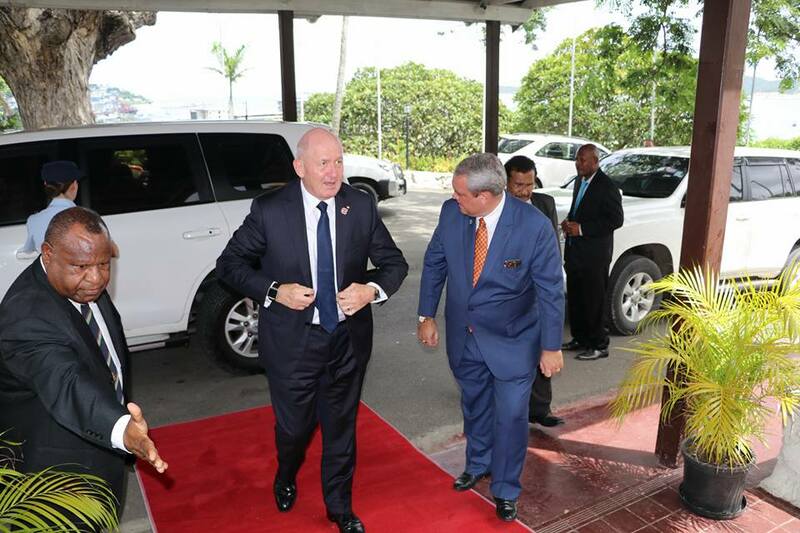 THE Australian Governor-General Sir Peter Cosgrove has arrived in Papua New Guineay for a three-day visit. He is accompanied by his wife Lady Lynne Cosgrove. His visit coincides with the commemoration of Anzac Day at Bomana War Cemetery. He arrived at 11am yesterday and was met by the chief protocol officer Morea Veratau and Minister for National Events Justin Tkatchenko at the Jackson International Airport. Sir Peter was taken to Government House at Konedobu to pay a visit to Governor-General Bob Dadae who spoke with Sir Peter before he was taken to the Bomana War Cemetery to pay his respects and present medals to family members of Air Squadron Leader John Jackson. Jackson was the man responsible for leading an air raid on enemy forces protecting the shoreline of what is now the city of Port Moresby. Jackson Airport was named after him. Sir Peter when presenting the medals thanked the late Mr Jackson’s family for his invaluable support. Sir Peter was then taken to meet with Prime Minister Peter O’Neill. He will begin his day today at dawn with the Anzac Day stand-to at Bomana War Cemetery.